Summer holiday is in the corner, it is the greatest event for students who have been buried with endless exams and assignment. No matter how you spend this summer holiday, you need entertainment to enrich your summer vacation, e.g. watching funny videos during the boring trip, sharing and enjoying favorite movie to increase your friendship with your bubby. How to realize that? Actually one of the practical ways is to download online streaming videos to hard drive or portable devices for watching them on the go or sharing with your families & friends since bookmarking is not a viable solution when it is offline. To ensure you could enjoy fluent videos, it would be better to save streaming video to hard drive ahead of time. However, if you have tried to save any favorite videos, you will find that the vast majority of online videos on the Internet are in the Flash Video that are highly-compressed but can't be downloaded by general browser as many people think. This is because streaming video is not a medium. Streaming is something that is constantly offered or played for anyone to view but does not mean you can record or download. And different sites also have different security measures put in place. That is why downloading streaming video does not work. What makes people more frustrated is some websites even charge for watching these types of videos. At this moment, what can help you out is a streaming video grabber that works on this. Three methods are listed below, you could choose the one that most fit you. Fast download online streaming videos in SD/HD/4K UHD formats from 300+ video sharing sites and save them to hard drive, iPhone XS/XS Max/XR, iPad Android. One of the easiest ways to capture streaming videos is MacX Video Converter Pro, which will brings you an ideal solution to save streaming videos from online video sharing sites including YouTube, Vimeo, Break, Google, etc. Besides, MacX Video Converter Pro is capable of converting among HD and general video formats on behalf of you, no matter for watching on major media players, edit via iMovie, or transferring to iPhone XS/XS Max/XR/X/8/7, iPod, iPad, Apple TV, Blackberry, etc. Besides using MacX Video Converter Pro to download streaming video, for those who uses Firefox, Download Helper is a simple extension that can also do this job. Once you successfully install this plug-in, the web browser add-on works right there where the videos are opened, then you could capture a file by clicking the related icon in the browser and save the video in its original format FLV. You are also allowed to convert the downloadd video to different formats, however, a ConvertHelper logo is inserted at the top left corner until you pay to register the program and you may run into DownloadHelper not working sometimes. Another way of capturing streaming video online is Keepvid, which is offered by Google to download streaming videos to your computer. It is extremely easy to use. All you need to do is just open the website, copy the URL of the video you want and paste this into the box on keepvid.com, then hit download. Then different video download URLs are produced with different output video formats. You could select the file to download according to your needs. However, it has limitations. You have to download Java before you save streaming videos and it is filled with advertisements. To sum up, downloading streaming videos is not difficult as long as you know any of the above solutions. 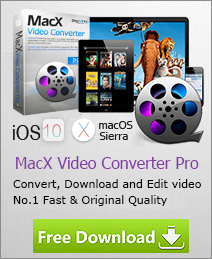 However, if you would like to watch the downloaded videos on devices besides computer, MacX Video Converter Pro is the most suitable one because it is an all-in-one solution for you to download, edit, convert and transfer videos to any format or any devices. No mention the speed factor involved in this process. Embedded with multi-core CPU utility and hyper threading technology, it is much faster than Keepvid and Firefox. Want to watch free movies on iPad? Guide on free movie downloads for iPad in full-length 4K/1080P/720P HD to watch movies on iPad (iPad Air 2, iPad Mini/3, iPad 4/3/2), including any Hindi, Hollywood, Disney movies is shared.